It can always be frustrating when your stamp does not stick to the block surface. It’s been a long time coming, but Stampin’ Up!’s new Cling Stamps are here! You can find these great stamps in the new Occasions Catalog. It will be so much easier to use these Cling Stamps. I know you will be impressed with them as well. I’ve had the opportunity to try them and it’s such a pleasure to use them. Just wait til you try them. I published the video Stampin’ Up! last month announcing the release of these stamps, now you can see their newest video to show you how they are mounted. Take a look below. Get these and other new products from the Occasions Catalog from my online store. If you have any questions about any of the new products, please don’t hesitate to contact me. You can get your hands on some new Clearance Rack items if you act fast. The Clearance Rack has had some items added to it recently. It was a surprise to me as well given that we already have a year-end closeout sale in motion. The Clearance Rack has a fresh face this week. If you like to save while you shop and plan ahead, this is the perfect time to take advantage of the savings. I know some of you are focusing on Christmas but sometimes we need a distraction from all the hustle and bustle. Take a minute to see what’s on sale. Some of the new products added are perfect for the new year and Valentine’s Day. Take advantage of this wonderful sale and pick up some products to add to your “loving” collection. You definitely don’t want to miss these products at these savings. Let me know if you have any questions about this sale. Specialty Papers are always popular and I do have a rising favorite in the new Delightfully Detailed Laser-Cut. Also, it’s perfect for creating beautiful and elegant projects. While it’s only one of the Specialty Papers, it can also be a beautiful accent to that special card. Take a look at this card I created using the new paper as well as a variety of other new products from the annual catalog. Simple and Elegant. This card was also created using the Love What You Do stamp set and one of our brand new colors – Grapefruit Grove. I really love this shade of orange and am so glad we have an additional option. It’s soothing and so natural. As with many new products, I bring you this lovely card to showcase these new products. A perfect example of how you can use just a portion of the Specialty paper. Simply add the paper alongside the edges leaving the bottom right for the sentiment. It makes a statement. Keeping the colors to just the Grapefruit Grove and white help with the simplicity. I have some great Swap Samples from our group meeting in May. We had a team swap for the Luv2 Stampin GA group meeting. I hope you enjoy some of the swaps as we really had a great time and love to exchange our swap samples. We used a variety of products on the samples and had a lot of fun with them. There are a lot of flowers and I think they make for some beautiful Spring cards. You will also find a handful of special occasion cards listed. I am always happy to have a good selection on cards in a swap. I hope you enjoyed the array of beautiful cards. The ideas and inspiration in my group is truly remarkable. Our projects really come to live with the vibrant colors and products. The samples were very motivational and uplifting. A couple of weeks ago, my husband and I celebrated our “40th Anniversary”! My how time flies. Naturally the special event necessitated a special card. When designing the card, I wanted to make a larger card than the normal size so that there would be ample room for my handwritten note. Thus, I made a card that would fit into a legal size envelope. When planning the card, I decided the Coffee Break Designer Series Paper had the look that I wanted for the card front and knew that for the special anniversary number, that the Number of Years bundle with the stamps and coordinating dies had to be used for the card too. I then looked through my other stamp sets to find additional words and a background stamp to help complete the card. By masking words from several sets, I was able to create a card that contained the sentiments wanted. As you can tell by the project material list, a wide variety of stamp sets were used! The color selection of Crumb Cake and Navy were the perfect combination. 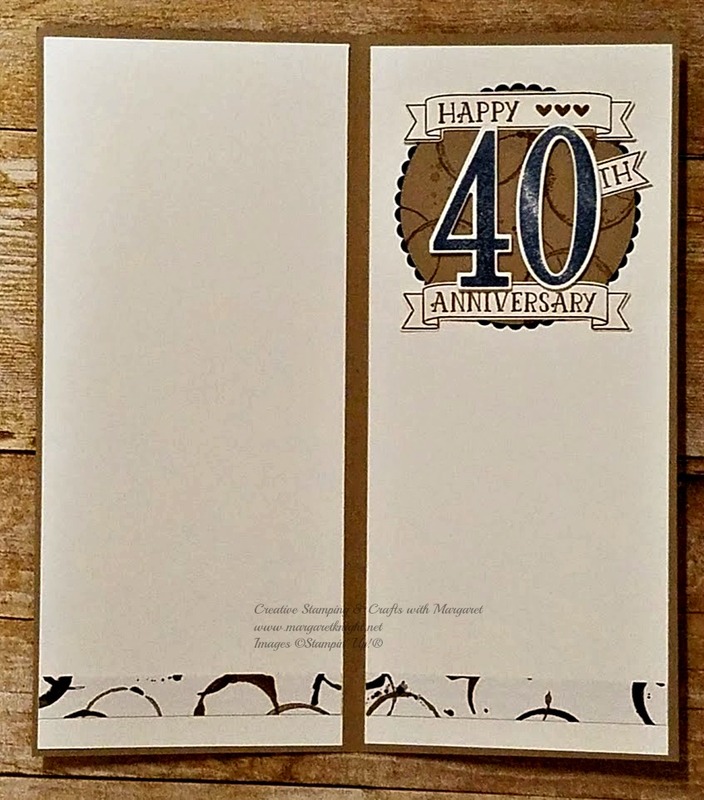 Of course, a handwritten sentiment was included to express my feelings of having achieved 40 years of marriage and the card was perfect to use for my expressions of love. We took a special trip to Sedona, Arizona to celebrate the occasion. It was a great trip and we have wonderful memories of our special anniversary! Have a great week and check back soon to see another project!